The owners of Phoenix Books, a Vermont-owned bookstore with locations in Essex, Burlington, Rutland and Chester, have purchased Woodstock's Yankee Bookshop. Michael DeSanto and Renee Reiner met with Susan Morgan - who bought the shop in 2001 - for the closing on February 1st. Yankee Bookshop first opened in November of 1935, making it Vermont's oldest continuously operated independent bookshop. "After 15 years of 24/7 ownership doing everything, including cleaning the toilet, I realized the bookshop needs fresh eyes and fresh passion to continue to be one of Woodstock's keystone businesses," says Morgan. "I’m tuckered out! Yankee Bookshop deserves owners who are media savvy. I want to see the Yankee Bookshop hit its 100 year mark and still be going strong. I know it can't happen with me as its owner, but when it happens I hope I'm here to see it!" While DeSanto says that a few alterations may be made as the new owners bring their own taste, style and interest to the selection of offerings and to the floor plan, they won't be making any drastic changes to the venerable bookshop. "We've signed a lease for the next 3-6 years," says DeSanto, "so we are not moving. We're keeping the name, Yankee Bookshop. Susan Morgan has passed on a thriving and successful bookstore; our job is to keep that going!" To aid in the transition in ownership, Morgan will stay on in the store for a few months and will be available for consultation after that. DeSanto and Reiner were the owners of The Book Rack and Children's pages, first located in Winooski, Vermont, and then Essex from 1995 to 2003, when they sold that business. The appeal of bookselling was too strong to resist, and the couple founded Phoenix Books in Essex, Vermont in 2007 and, in 2012, opened a second location in Burlington using a Community Supported Enterprise model. Following a recruitment effort by the greater Rutland community, including Green Mountain Power, the City of Rutland and the Downtown Rutland Partnership, and the addition of local partners Tricia and Tom Huebner to provide local leadership, DeSanto and Reiner opened Phoenix Books Rutland in September of 2015. In May of 2016, DeSanto and Reiner acquired Misty Valley Books, now Phoenix Books Misty Valley, in Chester Vermont. "We believe that local, bricks-and-mortar bookshops offer something very important to a community - a physical place to go to discover and exchange ideas, to have conversations with neighbors, and to gather as community members," says DeSanto. "It is part of our mission at Phoenix Books to ensure that local bookshops continue to be a vital part of Vermont's communities - and to engage with and serve the communities where we do business." Kristian Preylowski and Kari Meutsch met seven years ago while working in a bookstore, and between the two of them have close to twenty years of experience in bookselling. "We’ve both spent our lives working in the service industry, and understand what it means to serve our community,"says Meutsch. "Woodstock has a beauty and vibe that we find inspiring. We are excited to continue the work of an existing business that has so much history within the community and the state; both of us have a deep respect for independent businesses that have survived and thrived over time, and we cannot wait to do our part to keep the tradition of the Yankee Bookshop alive for years to come." 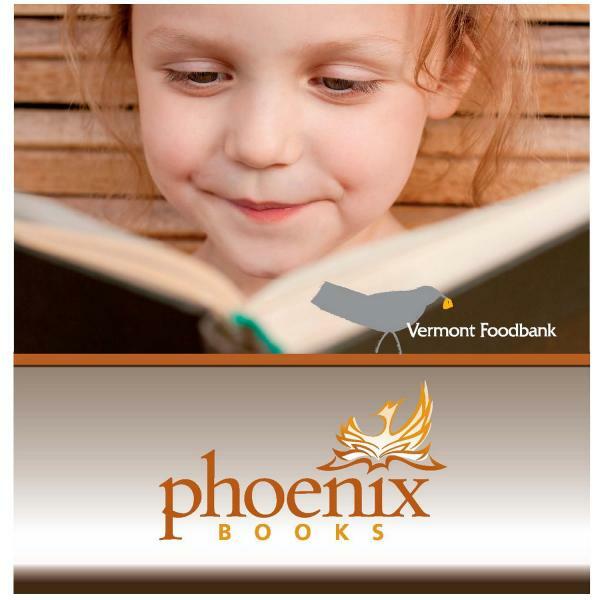 Phoenix Books is taking a stand against hunger this holiday season by matching customer donations - up to $5,000 - to the Vermont Foodbank between Thanksgiving and December 24th. The company - which has locations in Essex, Burlington, Rutland and Chester - has embarked on a year-long partnership with the Vermont Foodbank to raise at least $25,000 through a series of fundraisers. This matching program for December is the first of multiple events planned in partnership with Phoenix Books and Vermont Foodbank. The match is dollar for dollar so the more the community donates through Phoenix Books the more money raised for the Vermont Foodbank. "Food is personal for me," says Phoenix Books co-owner Mike DeSanto. As a small boy my family watched what we ate, and it wasn't about calories and fats but whether there was enough to go around. Counting out portions has always remained with me. A couple of years ago, I saw something that spoke about how hard it is for a child who is 'food insecure' to learn. And I recalled in that moment feeling hungry as a child." After meeting with Nicole Whalen and Cassie Lindsay of the Vermont Foodbank, DeSanto says, "I realized that I could commit my business and the stores in four communities to doing something significant to help with feeding our neighbors in Vermont." Customers at all four locations are invited to donate to the Vermont Foodbank by purchasing ornamental coupons off of a giving tree located near or at the cash registers of the stores. 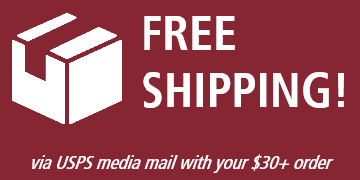 The coupons are simply added to the purchase or can be handled as a separate sale and contribution. The coupons come in denominations $1, $3, $5, $10 or $25, but any amount can be donated thru the registers. "Giving is simple and easy. All you need to say is I'd like to donate to the Foodbank and our staff will take care of everything from there." said DeSanto. 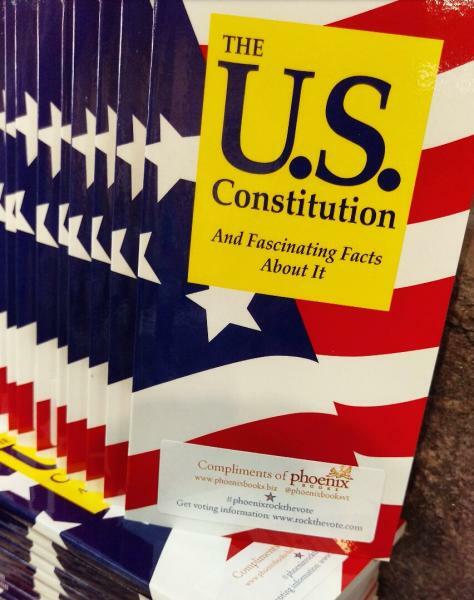 Two thousand pocket-sized copies of the U.S. Constitution recently arrived at Phoenix Books—but these books aren't for sale: Instead, Phoenix is giving copies of the Constitution away free to community members. 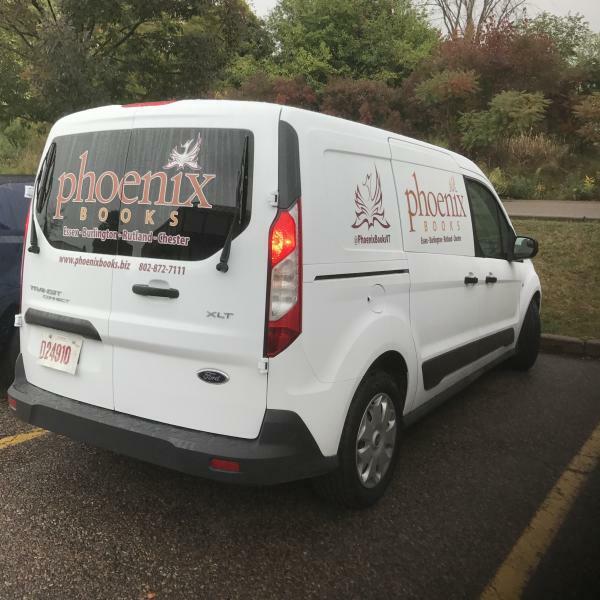 There is a brand new van parked in front of Phoenix Books Essex, and it is all decked out in colorful decals identifying it as the property of Phoenix Books. Why, one wonders, after opening a brand new store in Rutland in September of 2015 and acquiring Phoenix Books Misty Valley in Chester in May of 2016, did owner Mike DeSanto decide to buy a Ford Transit Connect in August? "Because there is an untapped market for increased sales to off-site customers and we need a vehicle to get the books to those customers - and those customers need to know who is bringing them their books!" says DeSanto. The staff at Phoenix Books feels there is potential to compete in school book fairs, business to business relationships, off-site author events, supporting authors at their speaking engagements and creating mobile bookstores for large community events. The van will allow Phoenix to do this in the market areas served by all four locations - Chittenden County and the areas surrounding Rutland and Chester - and the store is exploring the possibility of a delivery service, too. Two years ago, Phoenix Books brought 80 cartons of books for sale at the Vermont Flower Show held at the Champlain Fairgrounds in Essex Junction, Vermont. The business also brought portable point-of-sales equipment, displays, portable bookcases and numerous booksellers to assist with the endeavor of three days. Booksellers had to cobble together a rag tag fleet of vehicles to move all that to the site and back again afterwards. Instead of private vehicles or renting a van, Phoenix now has a company-owned vehicle to handle all the transport issues. "We believe there are many other opportunities like the garden show. And we have some amazing staff right now, so this off-site program will allow folks a chance to expand their horizons and bring in new business for Phoenix Books in a way they may not have thought about before," said DeSanto. Phoenix Books can now offer to deliver an endlessly varied mobile book store experience to any customer or group interested in adding books into their program. The van also serves as a highly visible, eye-catching mobile billboard and advertisement, a not insignificant value added part of the equation. Calling all kids! New weekly storytimes in Essex and Rutland. 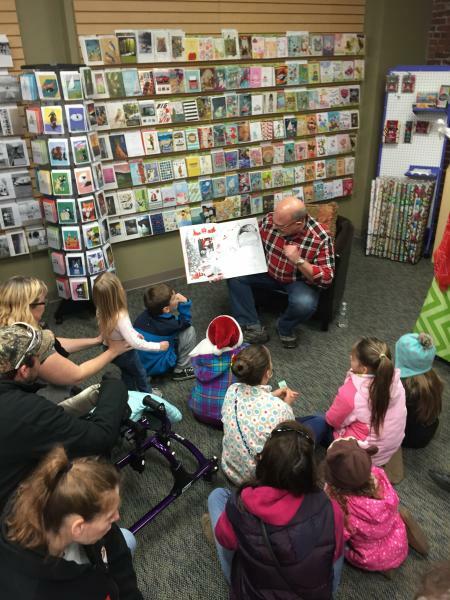 Phoenix Books is launching two new weekly storytimes: Phoenix Books Essex began holding a Whole Book Approach Storytime in August. Phoenix Books Rutland will launch a storytime on September 28th, the one-year anniversary of the store's Grand Opening. These are in addition to Phoenix Books Burlington's Saturday Storytime, which the business has hosted for several years. Phoenix Books Rutland's storytime will run weekly on Wednesdays at 11am. The first event will be hosted by a special guest, the Director of Rutland's Paramount Theater. 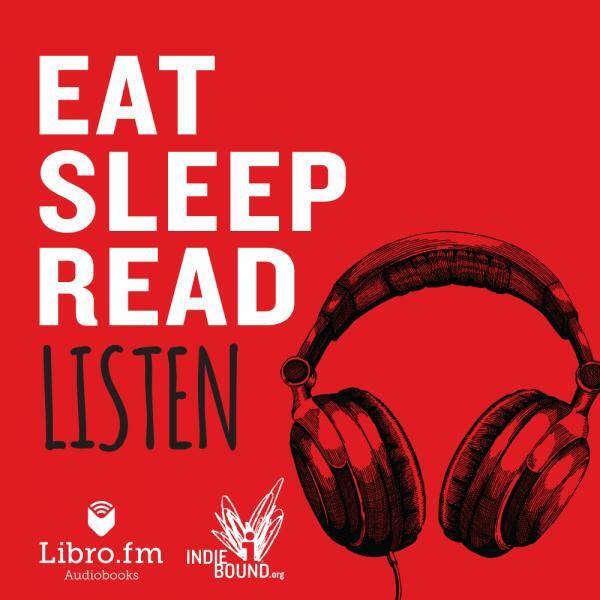 "We're thrilled to have Bruce Bouchard from the Paramount Theater as our celebrity storyteller," says Tricia Huebner, co-owner and manager of Phoenix Books Rutland. "What a great way to launch our Wednesday story hours!" Phoenix Books Essex's Whole Book Approach Storytime is being held weekly on Saturdays at 1pm, and will move to 11am beginning on October 1st. The “Whole Book Approach” is a storytime model that explores the ways that words, pictures, and book design work together to tell a complete story. It was developed by children’s literature scholar and author Megan Dowd Lambert in conjunction with the Eric Carle Museum of Picture Book Art in Amherst, MA. The concept of “Whole Book Approach” was sparked by a study of Visual Thinking Strategies (VTS), a collaborative effort of psychologists and art museum docents. The adult leads the children in reading the book, rather than reading the book at/to them. VTS questions are applied to picture book art by asking readers “What is happening in this picture?” “What do you see that makes you say that?” and “What else do you see?” One reader may see a great, big dragon in the clouds, another may simply see rain in the forecast; there are no right or wrong answers. Most weeks, the event is hosted by Phoenix bookseller Johanna Simmons. "I find the Whole Book Approach to be an incredibly effective story time model," says Simmons. "I love the way it encourages us to think outside the box, invites us to search for details in a book, and empowers us to approach each reading with curiosity and confidence." Simmons studied the Whole Book Approach with its creator, Megan Dowd Lambert, as part of her graduate education at Simmons College. The course focused on book design and its role in the overall narrative; paying close attention to trim size, orientation, cover art, endpapers, typography, and other components of the codex. Lambert - who is also the author of a book on the method, Reading Picture Books With Children - demonstrated her story time technique with young visitors at the Eric Carle Museum of Picture Book Art, and her students were able to observe firsthand how well children - of all ages and learning abilities - responded. Phoenix Books Burlington's Saturday Storytime, held Saturdays at 11am, has been running since 2012. This year, the bookstore has begun partnering with local co-operative grocery store City Market on some of the weekly storytimes. 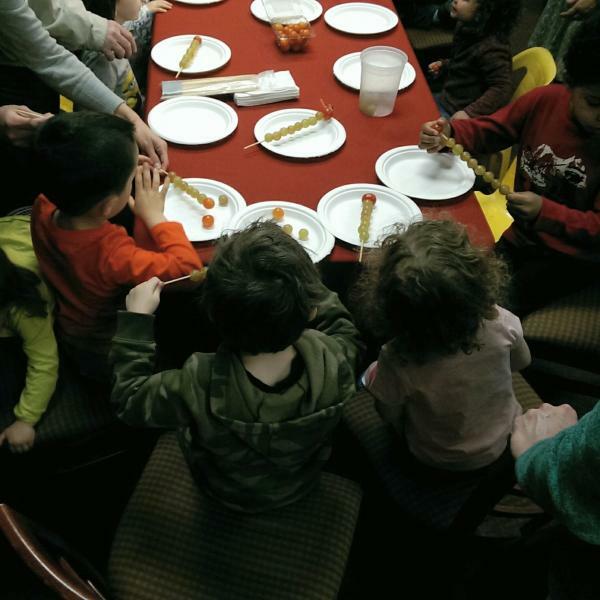 For example, after reading Eric Carle's The Very Hungry Caterpillar, children made caterpillar-shaped snacks from grapes and other fresh foods. Phoenix's next event with City Market, a Halloween-themed storytime, will feature witches' brooms made from pretzels, cheese, and chives, and will take place on October 29th. Keep an eye out for more events with City Market in the future! These storytime events are free and open to all ages. For more information, please call Phoenix Books Essex at 802-872-7111, Phoenix Books Burlington at 802-448-3350, or Phoenix Books Rutland at 802-855-8078. Bookselling this Week recently reported on Phoenix's support for Syrian refugees in Vermont. "Will Notte is using his role as senior bookseller at Phoenix Books in Rutland, Vermont, to educate residents about Syria and its people, following the mayor’s controversial proposal to let up to 100 Syrian refugees settle in the city. "Notte, who also serves as the president of Rutland’s Board of Aldermen and is strongly supportive of Mayor Chris Louras’ proposal, has set up a book display at the front of the store to provide residents with information about Syria and the plight of its citizens fleeing the Islamic State." "Books on display include Burning Country: Syrians in Revolution and War by Robin Yassin-Kassab and Leila Al-Shami (The University of Chicago Press); Soup for Syria by Barbara Abdeni Massaad (Interlink); I’m New Here, a children’s book about the experience of young refugees, by Anne Sibley O’Brien (Charlesbridge); and The Morning They Came for Us: Dispatches From Syria by Janine di Giovanni (Liveright), which has been the display’s best-selling book to date, according to Notte." Read the full article at Bookselling this Week! Each year, thousands of Vermonters weigh in on the state’s “best of Vermont” awards in over 150 categories for the "Seven Daysies." Seven Days announced the results today, and Phoenix Books was named as the winner of the "Best Bookstore" Award! "It is an honor to be awarded the Seven Daysies Award for Best Bookstore 2016," says Phoenix Books' general manager, Colleen Shipman. " Thank you for voting for us, and thank you for choosing Phoenix Books as your bookstore." 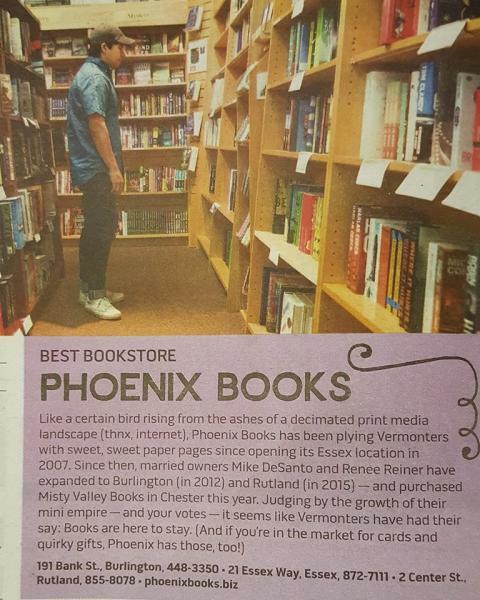 Seven Days readers also voted Phoenix the "Best Bookstore in Chittenden County" for the newspaper's 2013, 2014, and 2015 Daysie Awards, when the category for "Best Bookstore" was awarded for both inside and outside of Vermont's most populous county. This year, the category was awarded for Vermont as a whole, and Phoenix's fellow finalists in the Daysies included Montpelier's Bear Pond Books, Burlington's Crow Bookshop, and Shelburne's Flying Pig Bookstore, as well as Barnes and Noble. Earlier this summer, Phoenix Books was awarded the "Best of the Best" Reader's Choice Award in the "Local Bookstore" category by the Rutland Herald. Phoenix's fellow "Best of the Best" nominees were Rutland's The Bookmobile and Manchester's Northshire Bookstore. 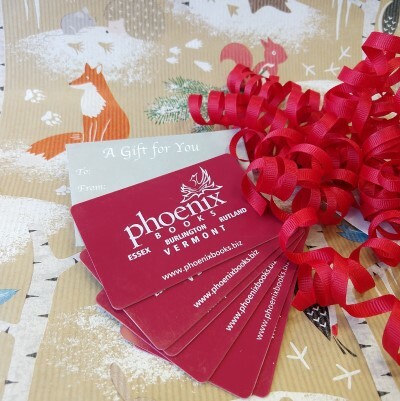 This was Phoenix's first year as a contender for the "Best of the Best" awards: Phoenix Books Rutland opened in September 2015, following a recruitment effort by Green Mountain Power in collaboration with the City of Rutland, Downtown Rutland Partnership, and local residents and businesses. The store is co-owned and managed by Rutland's own Tricia Huebner. "We are so excited to have won the Best of the Best award for Best Local Bookstore in Rutland!" says Huebner. "Our customers have really been there for us since we opened last September. Many, many thanks to all of those who voted for us!" 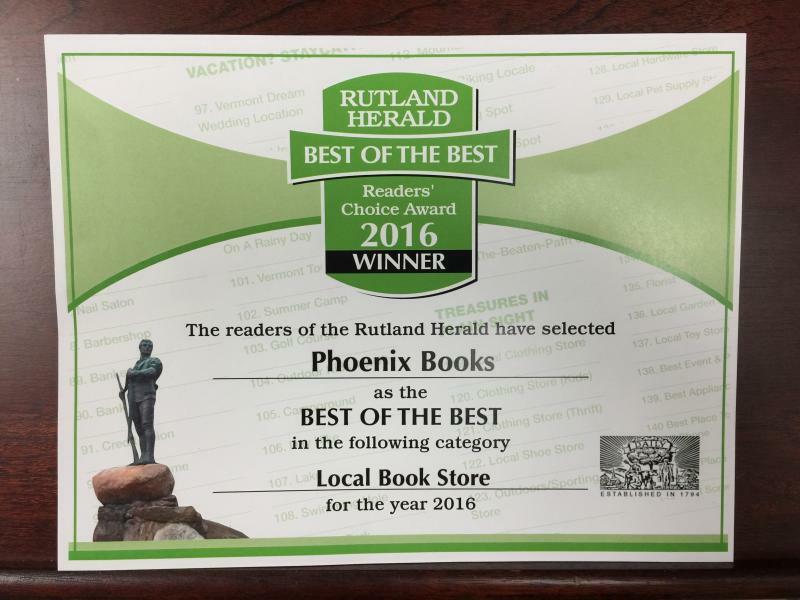 Thank you so much to everyone who voted for Phoenix Books in the Rutland Herald's Best of the Best annual poll! We're honored to have been chosen for the "Best Local Bookstore" award. The owners of Phoenix Books, an independent bookstore with locations in Essex, Burlington and Rutland, have purchased Chester's Misty Valley Books. Michael DeSanto and Renee Reiner met with Lynne and Bill Reed - who bought the Chester landmark in 2001 - for the closing on Monday, May 16th. "Twenty-one years ago," says Reiner, "as Mike and I embarked on this adventure, we considered buying Misty Valley Books from the original owners, Dwight Currie and Michael Kohlmann. So it feels like we've come full circle. We are so delighted to have Misty Valley as part of our Phoenix family!" Misty Valley Books. Photo courtesy chestertelegraph.org. "It feels fitting to keep Misty Valley going and growing as part of our goal to preserve local independent bookstores and strengthen the communities hosting the stores," adds DeSanto. "We hope to complete the transition with no interruption in the high level of service Chester and the surrounding communities have seen over the years. Bill and Lynne Reed have lovingly owned and operated this iconic New England independent bookstore, and our intent is to keep intact all the traditions surrounding the store while adding a few new ideas from the experience of owning and operating three other stores in Rutland, Essex and Burlington. The wonderful programming, especially New Voices and Vermont Voices, will continue, with guidance from the Reeds, we hope. The present staff has been invited to stay on, so customers may not even notice the change in ownership. We look forward to serving the community for many years to come." DeSanto and Reiner were the owners of The Book Rack and Children's pages, first located in Winooski, Vermont, and then Essex, for eight years. They sold the store in 2003, but the appeal of bookselling was too strong to resist. The couple founded Phoenix Books in Essex, Vermont in 2007 and, in 2012, opened a second location in Burlington. Last September, following a recruitment effort by Green Mountain Power in collaboration with the City of Rutland, Downtown Rutland Partnership, and local residents and businesses, DeSanto and Reiner opened Phoenix Books Rutland. The couple discovered that Misty Valley Bookstore was for sale at the New England Independent Booksellers Association Fall Conference in October of 2015, where Bill Reed wore a sign hanging on his back that read "Bookstore for Sale. (We're retiring.) Inquire other side." Now in its 29th year, Misty Valley Books occupies a beautiful historic building in a storefront location adjacent to the Fullerton Inn and across from the handsome Chester Green. Approximately 6,000 books are stocked, including current fiction and nonfiction in hardcover and paperback, art, poetry, spirituality, history, biography and Vermontiana, a young reader section and a children's room, plus greeting cards, magazines, calendars and toys. The store hosts numerous author events, including the prestigious Vermont Voices series in the fall and nationally recognized New Voices in January. The store has also provided off-premises bookstores for the Vermont Humanities Council Fall Conference, UVM's Asian Studies Outreach Program and local businesses and restaurants. 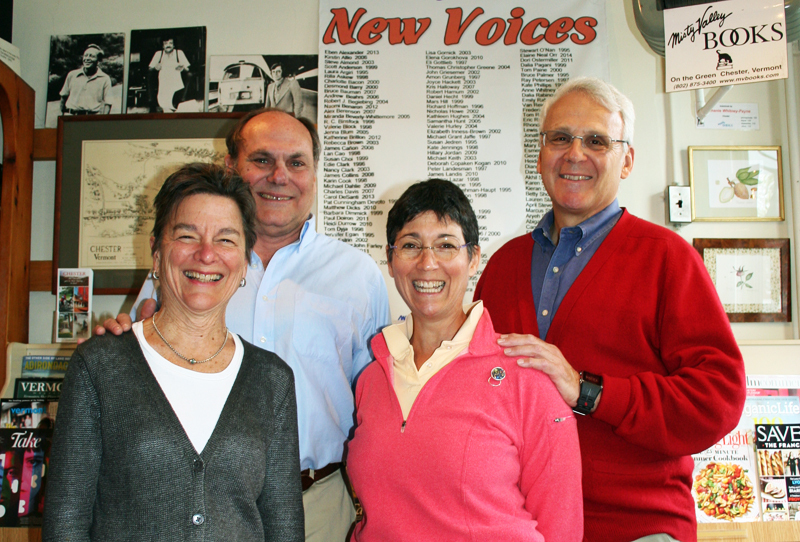 From left to right: Lynne and Bill Reed, Renee Reiner, Michael DeSanto. Photo courtesy chestertelegraph.org. "We are so pleased that Michael and Renee of Phoenix Books are buying Misty Valley Books!" says Lynne Reed. "Bill and I have had a perfect life here in Chester for the past fifteen years. What could be better than having a bookstore where everyone who comes in loves to read, where you get to have interesting and meaningful conversations every day, and where you know and love your customers. We are happy that they will be continuing Misty Valley’s strong commitment to our community, readers and author events including the well-known Misty Valley New Voices annual weekend for debut authors. They will be a great addition to Chester and the surrounding towns in southern Vermont." "We will miss the daily involvement with bookselling," adds Bill Reed, "but we are convinced by the Phoenix people we have met, and knowing [Misty Valley staff members] Kim, Amanda, John and Sylvan will continue to be the faces of Misty Valley Books, that Phoenix Books is the perfect succession. The bookstore we have loved and nurtured will be in very good hands." 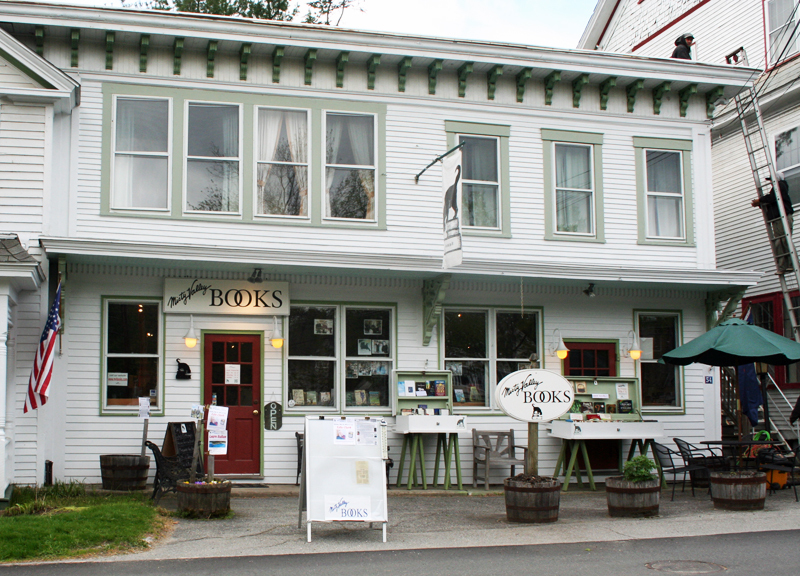 Take a literary tour of Vermont’s independent bookstores! Pick up your FREE passport at Phoenix Books or any of the 20 independent bookstores in Vermont and get started today! Or click HERE and download and print your own passport. BOOKSTORES WILL STAMP OR INITIAL BOXES AT LOCATIONS. Visit Vermont bookstores and win great prizes! Visit 5 or more stores: Vermont Bookstores pin! Visit 10 or more stores: Vermont Bookstores bumper sticker! Visit 15 or more stores: YAY! Vermont Bookstores magnet! VISIT ALL STORES: Vermont Bookstores reusable shopping bag! FINE PRINT: Visit 5 or more participating indie bookstores and get a stamp or initials to qualify for prizes. No purchase necessary. Please see the list of Vermont Independent Bookstores on the passport and listed below. Mail your passport to The Vermont Bookshop, 38 Main Street, Middlebury VT 05753 to be eligible for prizes.